Dear Attorney-General George Brandis, I have been a journalist for more than 40 years and I am also a blogger. You hardly ever seem to make any sense, but this time you take the cake in your comments on ABC’s AM earlier this month http://ab.co/1CuNCOp about the law to retain data of journalists and everybody else for two years in the interest of national security. I could go on, but you’ll probably hack my mobile, look at all my emails and send me to Indonesia to be shot by a firing squad. Prime Minister Tony Abbott also poohed-poohed the need for protection, citing his own experience as a journalist in the 1980s: “There were no metadata protections for journalists and if any agency, including the RSPCA or the local council, had wanted my metadata, they could have just gone and got it on authorisation.” Of course there was no metadata in those days, except basic landline phone records. Cartoon above courtesy of the brilliant Jon Kudelka. Hope you don’t join me in prison, Jon! Well, at least the Minister for Communications didn’t call the need for a warrant a “red herring.” And he used to be a journalist – before the internet existed. Senator Scott Ludlam has given Australians tips on how to hide metadata. He told Fran Kelly on ABC’s RN Breakfast: “If it’s good enough for a Communications Minister to be using a messaging ap [Wickr] on his phone that leaves no trace of the messages, then it’s entirely reasonable for me and plenty of other people to be offering advice on how people can protect their privacy on line.” http://ab.co/1GfzeJz Ludlam also repeated a selection of his tips after the Senate passed the bill yesterday to make sure they got into Hansard. So back to our good friend, George Brandis, who had this to say about the new law on AM last week: “Media organisations are not the target of this law. The target of this law are criminals and paedophiles and terrorists. I regret that the debate about this law has diverted down this path about journalists for heaven’s sake. Journalists are not the object of the law. This is a law that is, that continues to guarantee the availability to the police, to the law enforcement and national security authorities, essential evidence in criminal and terrorism investigations.” Senator Brandis repeated this numerous times yesterday: “This act is about serious crime … We are not interested in using this complex system to police parking tickets.”/”This is not what this bill is about. It’s about serious crime … That’s its entire purpose.” Liberal Democrat Senator David Leyonhjelm said: “I do not believe him.” Leyonhjelm said it would take time but eventually the authorities would use metadata on things like petrol prices: “I do not look forward to saying ‘I told you so’ when this law is used to pursue illegal dumping, unpaid rates, petrol stations comparing fuel prices. Mark my words however, that is what will happen.” http://ab.co/1Nkt1MP Leyonhjelm’s final words were emphatic: “I condemn this bill.” He was joined in his condemnation by Scott Ludlam and Senator Nick Xenophon. The haughty Attorney-General lectured both of them, and every time he mentioned Ludlam’s name, he almost spat it out. I am looking forward to hearing what Ross Coulthart has to say about the threats to journalists posed by the law when he gives his keynote address to the 2015 Press Freedom Australia Media Dinner in Sydney on May 1. http://bit.ly/1EEWtZe The theme this year: Press Freedom Under Surveillance. Boy, is it ever! There’s a whole new world out there, Senator Brandis, and it includes very, very, very astute, credentialed, experienced and important voices like that of Tom Krause. The fact that Tom – and a galaxy of other informed folk – CHOOSE to express themselves through “new media” is irrelevant to the protections they deserve. 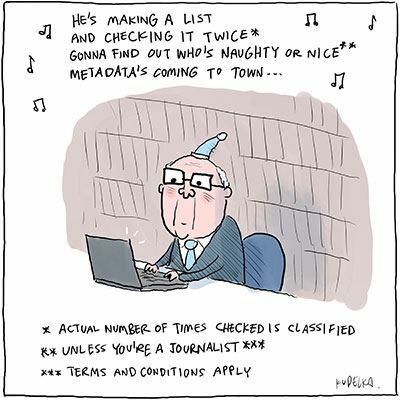 Brandis’ contemptuous demeanor, his apparent delight in not answering questions put to him – in interviews but most particularly in the Senate – and his slavish neo-con ideology make him unfit to be AG and a potentially dangerous individual whether he remains in parliament or not. PS Kym, and your blog as well. I now have the link!